Fig. 1 -View of the chancel of the Cathedral of Pisa, in the city of Pisa Italy, built between 1064 and 1118. The Figure of Christ is the background, in a gesture of blessing. 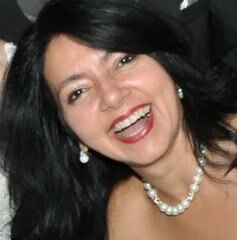 Rosângela Vig is a Visual Artist and Teacher of Art History. During a period of uncertainty, Dante Alighieri (1265 – 1321) lived his own hell, divided into the Classical Culture of the Ancient History and the Culture of Christianity of the end of Middle Ages; amid the injustices of the period and the search for spiritual and ethics sublimity; and his suffering, for the loss of his beloved Beatrice. The epic poem was written in, Italian with philosophical foundation. In the story, Dante was taken by Virgil, his favorite classic author, from Purgatory to Paradise, where he found his beloved. The Work shows the thoughts of men at the end of the Middle Ages, divided by the Reason and the Faith, and it anticipated the Humanist thought of the Renaissance. The Middle Ages lasted ten centuries, starting from 476 476, when the Western Roman Empire collapsed after the barbarian invasion. And, though there is not an agreement, it is estimated that the Fall of Constantinople (currently known as Istanbul) invaded by the Ottoman Empire, in 1453, plus the end of the Hundred Years War between France and England, are the facts that define the end of this period, considered the longest of History. It can be considered two phases of the Middle Ages, the Early period, from the 5th up to the 11th century and the Late period, from the 11th up to the 15th century, though there are some Historians who consider three phases. The Western Art then was represented by two main styles, the Romanesque and the Gothic. The beautiful, on the other hand, won’t be studied on this text, but, it was an important style that flourished in the Eastern Rome in the period. The centuries were uncertain after the Fall of Rome, the decline of the Ancient World and the almost complete, vanishing of the Classical Culture. When Charlemagne was crowned by the Pope Leo III 800, however, there was a growth, of the, Western. The emperor preserved the Greco-Roman, preserved the legacy Greek-roman and fostered artistic development. Besides, the Literary Academy, he created the workshops linked to the palaces, with the initial goal to make manuscripts and sacred texts, since they were still handmade written and illustrated. These workshops became Centers of Art and, even after the reign of Charlemagne, their activities were concentrated in the monasteries, which served as Schools of Art, and where they taught, the making of books, the Painting, the Sculpture, the Architecture, among other activities, including the making of bells. The Romanesque style, still under the influence of the Roman Architecture, presented the semi-circular arches, the use of vault and solid pillars for a good support, and the thick walls and narrow openings for the windows. The churches, called the Fortress of God, had solid and strong structure and they stayed on the routes of pilgrimage, such as the Saint-Pierre Abbey, on the French route of Santiago de Compostela. Fig. 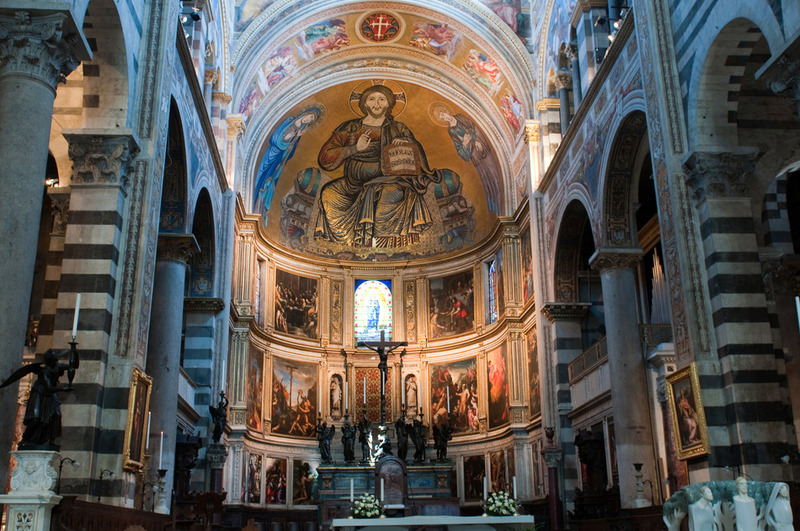 1 -View of the chancel of the Cathedral of Pisa, in the city of Pisa Italy, built between 1064 and 1118. The Figure of Christ is the background, in a gesture of blessing. Romanesque art and Gothic art. Since the vaults and the walls were thick and large, the painting of murals, with the fresco technique could be improved (Fig. 1). The theme on them, was the same as of the books; there were episodes of the Sacred History; there were no animals, or daily activity scenes. The molds of the work Romanian, as in the Roman Art, had to narrate, the facts on the work and to include a mystical interpretation of the reality. The characters were presented in different sizes, Christ was usually painted bigger than the others and, to reinforce the blessing gesture, His arms were generally oversized. There was a certain notion of depth, but since the center of attention wasn’t the imitation of the nature, the idea of shadow wasn’t reinforced. On the Works of the end of the 12th century, it can be perceived that the shapes became solid and standardized. The Sculpture of this period complemented the sacred spaces, and composed the facade and the portals with Biblical passages, as a trial to cause visual impact. As well as in the painting, there was a hierarchy of the figures, according to their symbolic value. Fig. 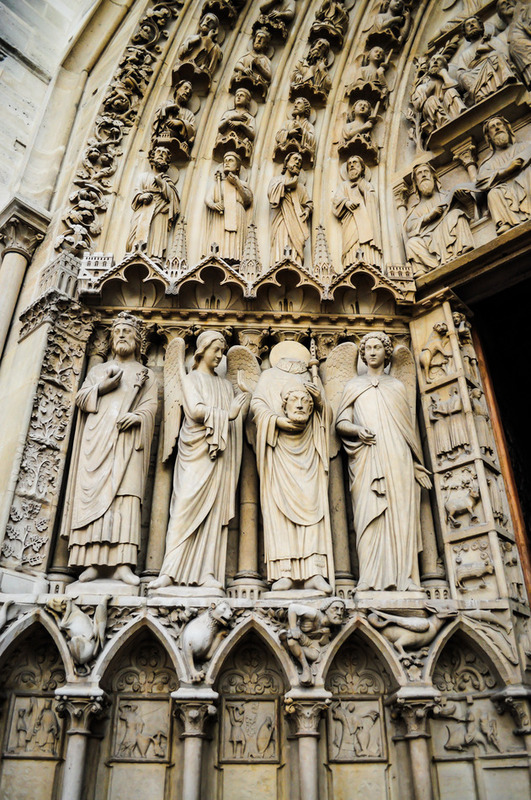 2 – Detail of the Cathedral of Chartres, France. Romanesque art and Gothic art. In the Western Europe, until the 12th century, life prospered in the countryside. The libraries were in the monasteries, where the Art was taught, spreaded and made. Since the 12th century though, the commerce developed in the cities, and the bourgeoisie, made of merchants emerged. The cities became places for debating facts, ideas and thoughts. All these facts brought new ideas, for the Art too. The Gothic style, appeared in this context, opposed to the Romanesque, as a modification in the Architecture and, even if it looked strange in the period, nowadays, it is considered one of the most beautiful and replete of meanings. In the form, of the Gothic Architecture, in its shape and beauty is seen on the pointed arches or ogives shaped, as they are commonly called, since they are not round, as in the Romanesque Art. Complementary to the style there are also the ribbed vaults; bigger windows with stained glass, which would allow more light inside the room; the large amount of ornamental details; the carved pillars; and the pyramid shape of the roofs. The flying buttress would allow the weight to be well distributed in the columns and in the walls, that could also be taller. As a result, there was a sensation of verticalism, of light, and of majesty, but above all, a sense of lightness and delicacy. It is clear the objective of a work facing the mysticism and ascent to God. The Sculpture appeared as a complement of the Architecture (Fig. 2 and Fig. 2.1), composed the portals and the facades of the cathedrals, such as in the Romanesque Art. The figures, of people followed the Gothic style, and were long and slender, bringing a sensation of verticality and, even the gestures and the expressions, reached more dynamism and naturality in the course of time. Similarly to the Sculpture, the Gothic Painting, expressed a narrative and Christian meaning in the beginning. Among the painters, Giotto Bondone (1266 – 1337) who, by his frescoes, for the ornamet of churches, as the Scrovegni Chapel, Italy, his greatest work. There, artist then demonstrated the religiosity as a main theme, described biblical scenes and, although he emphasized the figures os saints, they would appear there as ordinary people. This would anticipate the humanistic vision that would be consolidated in the Renaissance. But the Gothic Painting didn’t use only the religiosity, in its theme, The Works of the later period presented an approach with the reality, enriched with details, more notion of perspective and of shadow. Van Eyck (1390 – 1441), was the pioneer of the Portrait Art, and he tried to reach the work to the reality, by using vivid colors and by revealing details of the urban and social life of the period. The Couple Arnolfini 1, his oil painting was one of his worldwide famous Works, from 1434, made, on oak panel, It has details , for the period, innovative for the period. The Merchant and his wife, with foreground, but the objects, and the furniture of the house behind, and round them can also be seen, as an way of approaching the daily life of the period. There is a mirror among these objects, where the painter may have portraited himself. On the field of Painting, were also of great importance to the Iluminuras 2, They were ornamental paintings in manuscripts, made in the convents, monasteries and abbeys. Most texts, mostly with religious themes, and received decoration in the initial letters, on the borders and there were illustrations in small spaces, where the artist had to prove all his ability and boldness. Fig. 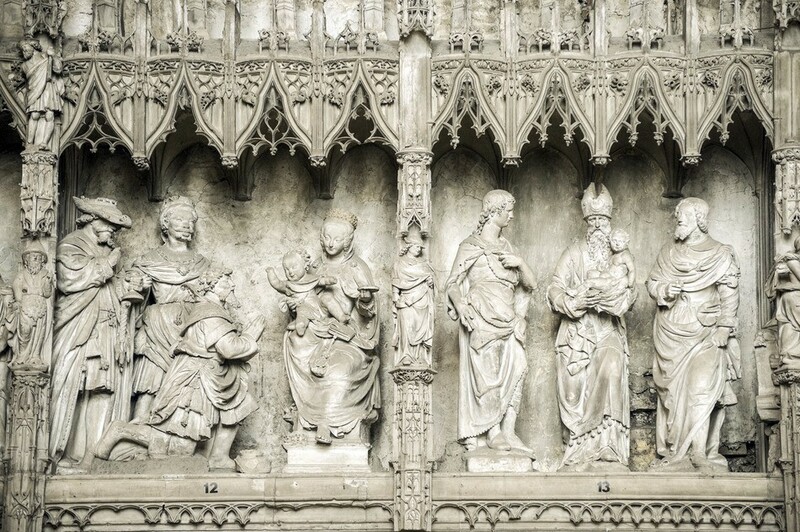 2.1 – Details of the Cathedral of Chartres, France. Romanesque art and Gothic art. Besides the The Divine Comedy of Dante, all the lyricism of the troubadours was another trace of Literature, of this period that emerged within the mysticism and the religiosity of the Middle Ages. This movement started in the South of France, and spreaded throughout Europe. In the 12th century, the jesters and the minstrels presented their shows in castles and in squares, as an enternainment for the court and for the people, They sang the poems composed by the troubadours in which they described the duels, the stories of love and the knights declared love for a lady. The Chivalric Novels were born in this context, and they narrated the idealized and impossible love, he bravery deeds and the adventures of the medieval knights, such as the Holy Grail story, with the legendary figure of King Arthur. And from the 13th century, the legend of Robin Hood, still survive as a hero that lived in the forests and in the children’s imagination. You raised them Lord. Because you are beautiful, they are beautiful; because you are good, they are good; because you exist, they exist. They are not so beautiful as you, not even so good, not even they exist the same way as you, their Creator. (AGOSTINHO, 1999, p.314). My God and my Glory, I have reasons to sing for You an anthem until now, offering You a sacrifice praising my Sacrificer, because the beauties, that pass from the soul to the hand of the artist, come from that Beauty that is above our souls and through which my own soul sighs night and day. (SANTO AGOSTINHO, 1999, p. 295). Augustine of Hippo had a neoplatonist, thought and he believed in God as being a superior intelligence, creator of the prototypes of the visible world. However, him though, the Beauty, was connected to the existence of things and of men, as an act of God in all His power. The Beauty was not superfluous, but a way of disrupting with the Chaos and recovering the real feelings. The work of Art would be the product of a moral precept and brought out the soul of the artist. With this, he raised the men and his inner feelings. The Middle Ages Culture has the meaning of innovation, tries to hide it under the repetition (opposite to the Modern Culture that pretends to innovate, even while repeating). Fig. 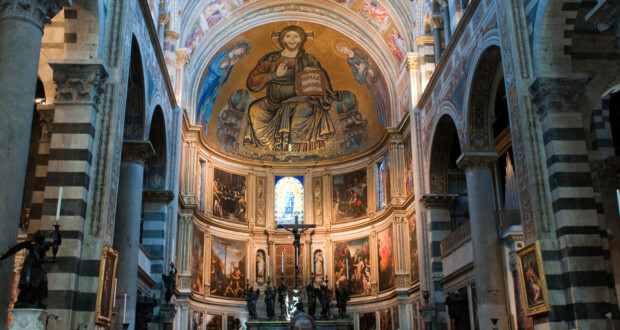 1 – View of Chapel of the Cathedral of Pisa, in the city of Pisa Italy, built between 1064 and 1118. The Figure of Christ is the background, in a gesture of blessing. Fig. 2 – Details of Cathedral of Chartres, France. Fig. 2.1 – Details of Cathedral of Chartres, France. Fig. 2 – Details of the Cathedral of Chartres, France. Fig. 2.1 – Details of the Cathedral of Chartres, France. Summary : Rate the article! Thanks for your participation! !